Humans are one of a kind. We have emotions, feelings, rational thinking, we cry, we laugh, we think; that’s what makes homo sapiens, another genus that walks the face of the earth different from others that walk on it and have walked it over a period of a billion years. We want to convey what we feel through various forms like a song, a painting, a dance or a written word. Since India has a distinct quality of civilizational roots that first took form here and culminated in the present form visible, we are a land of earliest paintings that humans started drawing in the rock shelters he inhabited. From there onwards the caravan started and it has not stopped as more talented and intellectual painters joined the pool. So, to understand the epochs of this colorful caravan of traditional Indian paintings, we classify them in different kinds of paintings. Cave Painting– Pre- historic records of paintings exist in the pits of caves like Bhimbhetika, Ajanta, Ellora and Elephanta caves. Some of them have been declared as world heritage sites and they attract multitudes of visitors thronging the place to have a glimpse of how early humans lived and what evoked such paintings on the walls of caves. Madhubani Painting– From the interiors of a Bihar village, Maithali, this painting crossed topographical latitudes and longitudes of the nation to come across as a painting that is culturally acceptable to all regions of India. It has become very easily identifiable and relatable paintings of all times. Tanjore Painting– Coming from a place Tanjavur in Tamilnadu, these are native to the place. These south Indian paintings depict Gods and goddesses adorned with precious stones, pearls and glass that increase its appeal and add a local touch to it. These embellishments with the rich composition and variety of colors are starkly its recognizable traits. 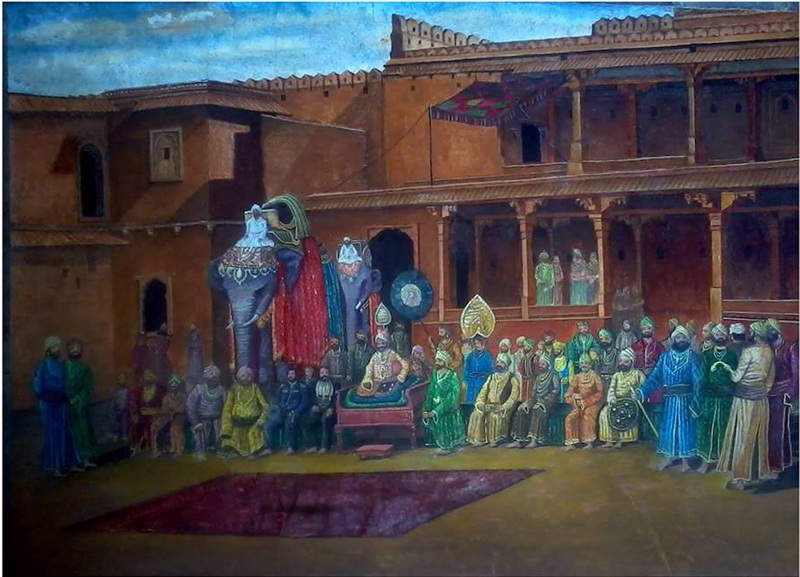 Mughal Painting– The era of Mughal rule brought with it a cocktail of Indian mixed with Islamic and Persian styles of painting that are reflective of its times and culture and depicts portraits of emperors and queens, courtyard, battles, elephant and horses, hunting expeditions etc. Miniature Painting– As the name itself presents, these are paintings that are small in size nonetheless colorful. They in themselves can be classified in different schools of Rajputs, Mughals, Deccan, Pali, Rajasthani etc. The colors are organic and made from natural products like minerals, plants, conch shells, stones and the likes. They are a melting pot of different styles and themes. Gond Painting– These are the handicrafts of various tribes of central India who embellish their walls with local flora, fauna, Gods and human’s relationship with his surroundings that used to be originally created at times of festivals that later came about as the focal point of their culture. Kalamkari Painting– Etymologically stating a work that is made by a pen, made popular in parts of Hyderabad and Golconda, they contain a very fine and minute subtlety to them. Organic dyes prepared from plants were used along with blocks to create them. Wall murals of temples were decorated with them, stating mythological stories. Pattachitra Painting– It refers to the paintings on clothes and traditionally is linked to the worship of Lord Jagannath. Indigenously painted with a bamboo brush and mineral colors, they are subjected at mythological, religious and folklore of Odisha that still survives to the present day. Volumes have been stated at innumerable times about various art forms present in India, but what needs to be done is let this not be just on paper, to conserve the mosaic of our tradition by exhibiting the talents of our local artists and helping flourish their dying and depleting resources and spreading their artworks across the latitudes and longitudes of the country. You are currently browsing the Indian Art Blogs blog archives for March, 2016.